On Jan. 1, 2015 all employers covered by OSHA’s Recordkeeping Rule will be required to report to OSHA the following work-related incidents within the specified time frame: all fatalities within eight hours; and all amputations, losses of an eye, and in-patient hospitalizations within 24 hours. 1) Call your nearest area OSHA office, during normal business hours. 2) Call the 24-hour OSHA hotline at: 1-800-321-OSHA (6742). 3) Submit the incident details online at https://www.osha.gov/report_online/. NOTE: Employers under federal OSHA jurisdiction must comply with the new reporting requirements by Jan. 1, 2015. Employers covered by State Plans should contact their respective state offices to confirm their respective implementation dates. 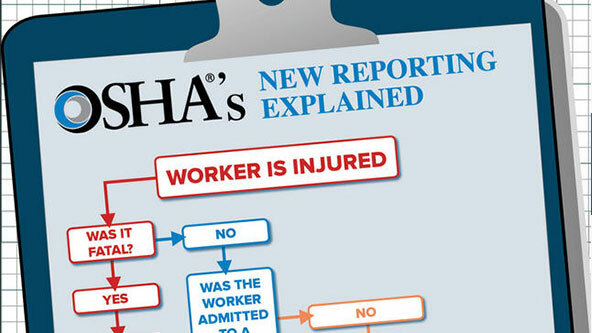 On Dec. 11, OSHA held a live Twitter chat to answer questions about the new requirements. Assistant Secretary of Labor Dr. David Michaels published these FAQs from the chat on his blog. “Q: How can an employer confirm the report from an injury has been documented? A: If you do it online, you will receive email confirmation. By phone, you will be speaking directly to OSHA representatives. Q: What is the best URL on the OSHA site to point our branch offices to for details of their obligations to report? Q: What constitutes formal admittance for care? Surgeries can be either outpatient or inpatient. For more information about the modified rule, read our blog article “New, Tougher OSHA Requirements Mean More Reporting, Fewer Exemptions” or register for our free Recordkeeping webinar at http://www.msdsonline.com/resources/webinars.